More than half of America’s population lives within a few hours of the ocean; many others live near a major river or lake. In this Carolina Planning, we explore the particular planning demands and development opportunities presented by waterfronts. In particular we look at the social, environmental and economic aspects of waterfront planning, and the conflicts that arise among them. Wallace looks at changing conditions for ports, such as the increased competition for waterfront land. Land Use policies of port authorities are discussed, as are economic impacts and guidelines for non-maritime development. Tampa Bay is cited as a case study. Toledo, Ohio’s riverside and portside development is discussed from an historical and recent perspective. PROTECTING WATER SUPPLY WATERSHEDS IN NORTH CAROLINA: THE RULES AND THEIR IMPACTSMoreau, David; Gray, Jeri; Watts, KathyNorth Carolina’s classifications and standards for watersheds are presented. Impacts of rules on residential development, their economic impacts, and land requirements and needs are discussed. Heraty, Maureen; Roenigk, DaleNorth Carolina’s Coastal Area Management Act history is overviewed. A survey of thirty North Carolina governments was taken to judge the law’s effects on land use planning. Directions for the future are also discussed. 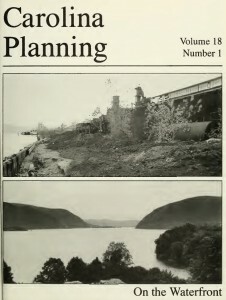 The tension between industrial development and natural preservation is outlined in this case study of the Hudson Valley. History, land preservation measures, and waterfront development measures are discussed. This federal program’s approach, management process, and success is evaluated. The Albermarle-Pamlico Program of North Carolina and Southeast Virginia is presented as a model. The Charleston Harbor Estuary restoration is discussed as a model for consensus building and as a program of the National Estuary Program.